For four months since I updated my Nexus 5 to Android 5.0 Lollipop, my phone has been suffering from severe memory leak. A memory leak happens when the system doesn't release RAM back for the user. In this case, after several hours of uptime, Android 5.0 was reserving 1GB of RAM for its use and aggressively killing off apps. Yesterday I applied the latest Android 5.1 update on my Nexus 5. I declared, prematurely, that my phone was finally usable. It was true, at first. With a fresh boot, the phone was quick off the mark. It may be placebo (or wishful thinking), but it felt like what a Nexus phone should be. Soon after (and I mean roughly 6-8 hours later) however, the dreaded memory leak bug reared its ugly head. Since 'upgrading', I have rebooted my phone twice. Like Android 5.0 and 5.0.1 before, 5.1 requires me to reboot every 8 hours in order to force the OS to release RAM. It means that the first thing I do when I wake up in the morning and before I go to the bathroom is to turn off my phone, wait for it to turn off, and then switch it on again. And then do it again later in the evening. And again. And again. A first world problem perhaps, but one I have paid good money to enjoy. 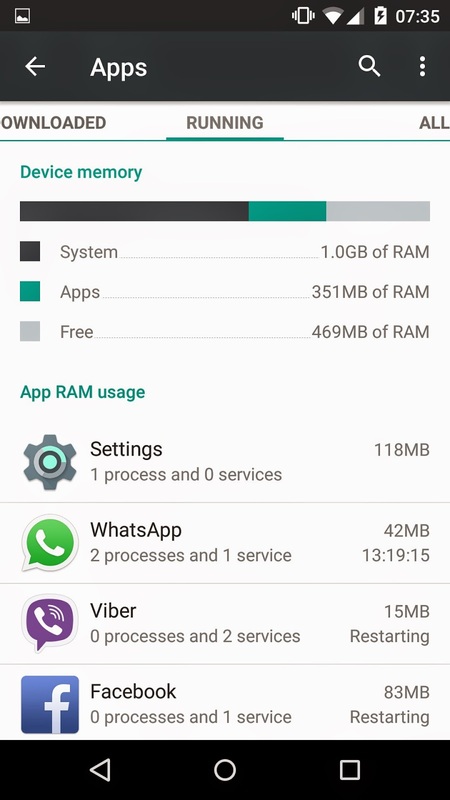 While 2GB of RAM is plentiful for a phone (Apple and Microsoft can get away with 1GB! ), I can see why Android apologists are demanding 4GB of RAM on their newest gadgets. It may be powerful and filled to the brim with more features we do not need, but Android is the very definition of inefficient. With Google's inability to do a very basic job, their reluctance to fix critical bugs (so they can sell new phones and fill their landfills with still pretty decent phones), I think I am done with Android. Time to look into this Windows 10 phone thingy I've been hearing about lately.